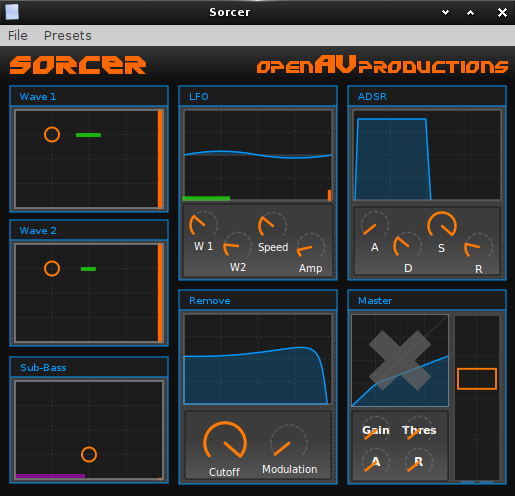 Sorcer (version 1.1 shown above) is a polyphonic, realtime, linux-based wavetable LV2 plugin softsynth developed and maintained by Harry Haaren of OpenAV Productions. Sorcer has two waveform tables with a unique design and color coding, which provide for creating a slew of wavesounds. An additional sub-bass wave is provided for additional tone color and modulation. The LFO section allows for control of the rate and amount of modulation desired, as well as control of the amount of each of the two waveforms to be modulated. Sorcer also has a filter section (below the LFO section) which allows control of the filter, and both cutoff point and modulation level of this filter are also adjustable. A standard ADSR amplitude envelope is provided, to contour the final sound to taste, and a gain/threshold section allows control of the overall amplitude level.